This nifty bicycle/ motorcycle has a motor to the rear of the back wheel, and what is exceptional about this motorcycle is that the exhaust from the gasoline engine is routed into the bike frame, so that the foot pegs and handlebars can be heated. 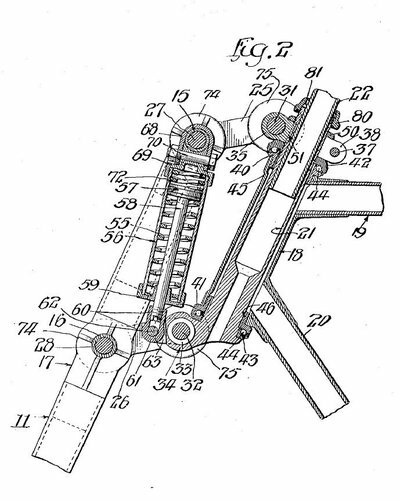 The inventor is from Ohio, so this modification would help the motorcycle be a year around mode of transportation. 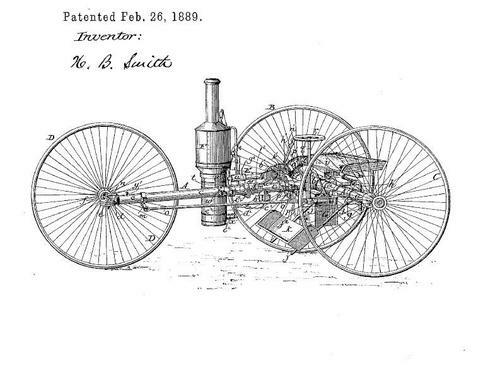 The rear wheel is driven by the actual piston rods of the gas engine, like an old steam locomotive. Glenn Curtiss Just Needed a Little More POWER! 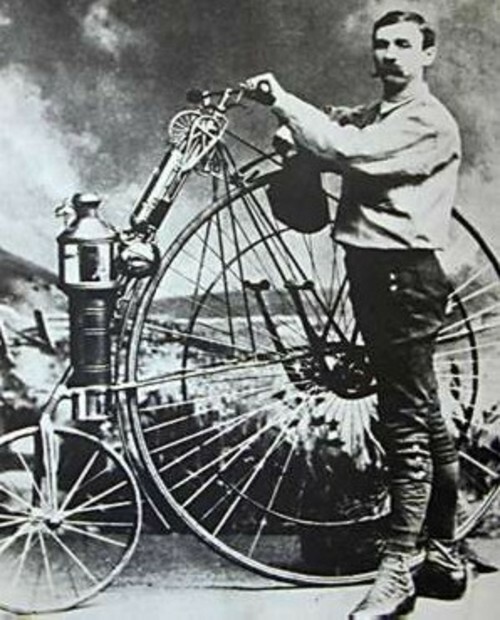 Glenn Curtiss had an early interest in bicycles, and opened a bicycle shop in Hammondsport, New York. Not content to sell bicycles, he was soon building his own products, and designing new models. When small, one cylinder motors were put on bicycles, he left the world of bycicles and entered the world of engines and motorcycles. He designed his own lightweight engines, and the motorcycles they powered. 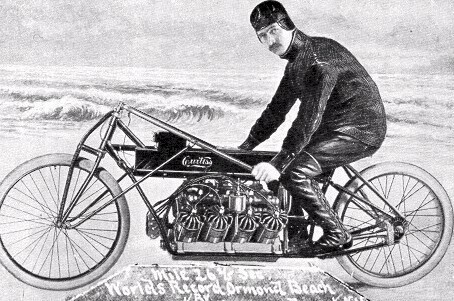 In 1907 Curtiss drove a motorcycle with an air cooled V-8 engine to a speed of 136 miles an hour. 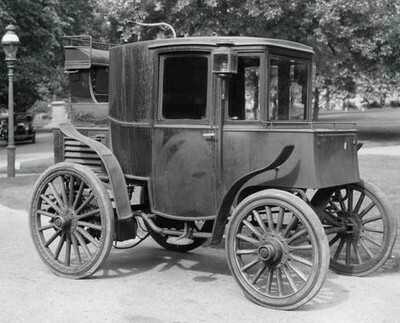 The engine delivered 40 hp, and weighed 275 pounds. 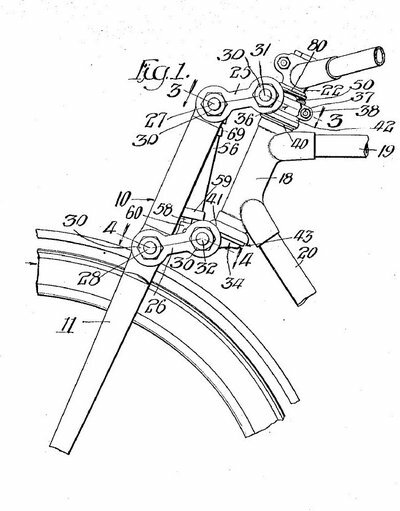 According to a Scientific American article of the day, the motorcycle experienced a broken universal joint at 90 mph, which buckled the frame. The record made him the fastest human on a motorcycle or car, until a car beat that speed 11 years later. A motorcycle would not beat that speed until 1930. Curtiss' speed was actually slower than an earlier Stanley Steamer that achieved 140- 150 mph, but that run was not an officially timed event. Looking at the picture below, I'm not sure I'd want to go 136 mph on bicycle wheels. 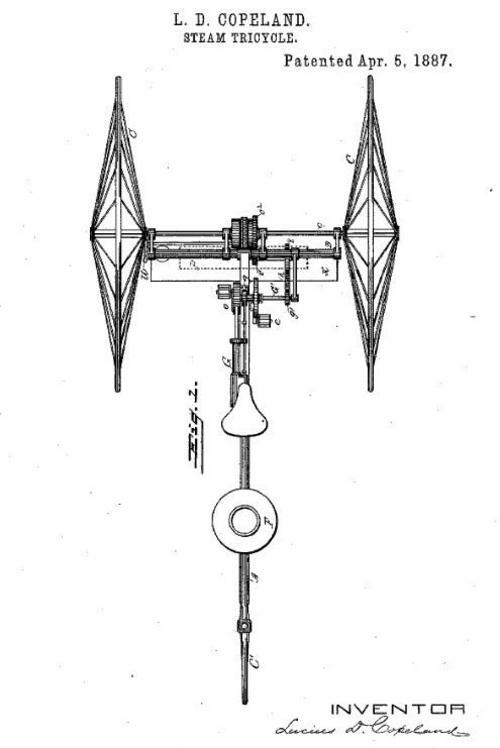 Cutriss was drawn into the field of avaition because of his lightweight yet powerful motors, and competed with the Wright brothers as pioneer avaiator and airplane designer. He designed the first float plane, aelerons, and many other new features in airplanes. Curtiss airplanes served in WWI, and Curtiss' company became Curtiss Wright when it merged with the successors of the Wright Brothers. 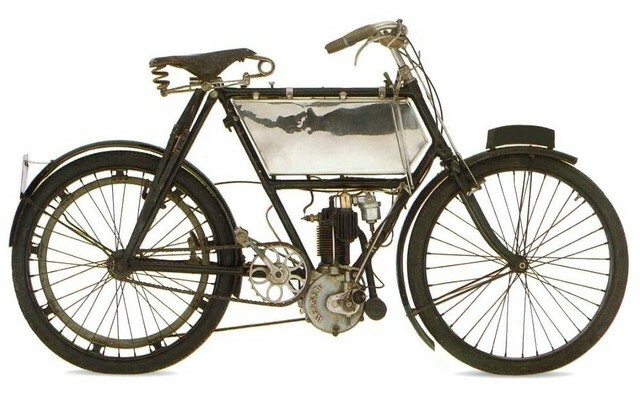 The first NSU motorcycle rolled out of a sewing machine factory turned bicycle factory turned motorcycle factory, in 1901. The NSW factory was in Neckarsulm Germany. The 1901 model used a motor made by the Swiss company called Zedal. 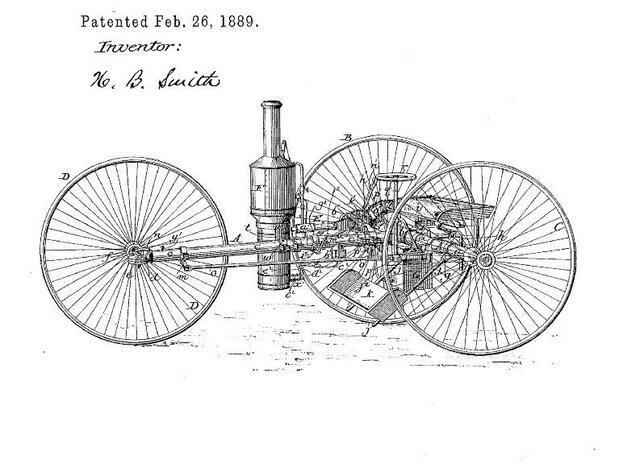 It was a 234 cc engine which put out 1.75 horse power, and had a top speed of 48 km/hr, or 31 mph. 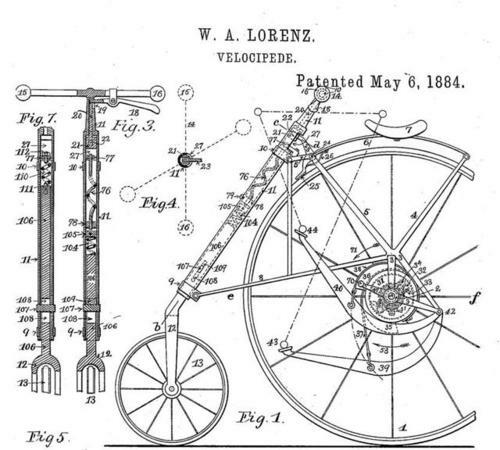 It had a bicycle type frame, which made sense since it was made in a bicycle factory. 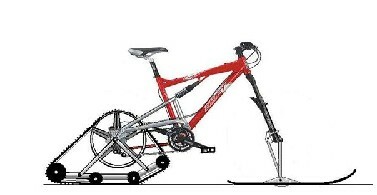 In bicycle fashion, it has a chain and freewheel, and a bicycle brake on the front wheel. 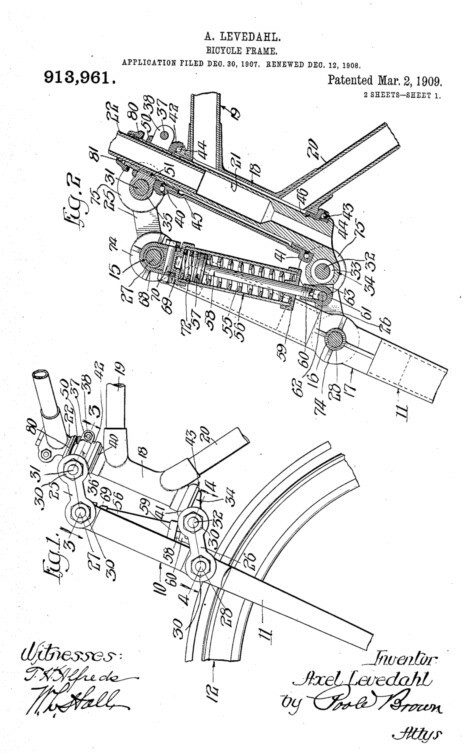 NSR went on to make motorcycles, sidecars, and tracked motorcycles for the German army in WWII. 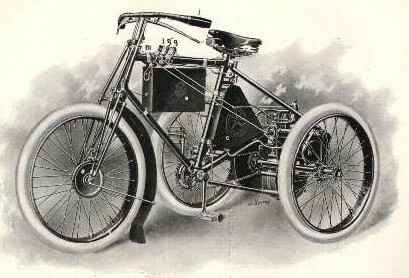 Drawing by Motorcycles of the 20th Century. 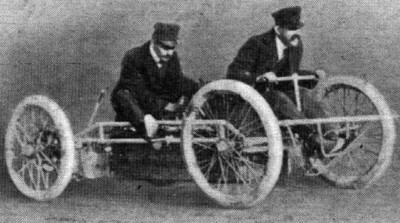 The brothers Michel and Eugene Werner, Russian immigrants in Paris, built a motorcycle in 1897 based on a bicycle frame. 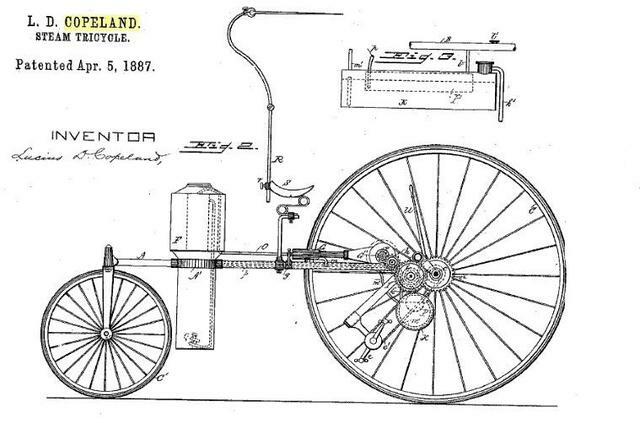 It had a motor mounted over the front wheel, and drove the front wheel by a belt. It proved to be top heavy and hard to control, so an improved model was built with the motor mounted low on the frame. 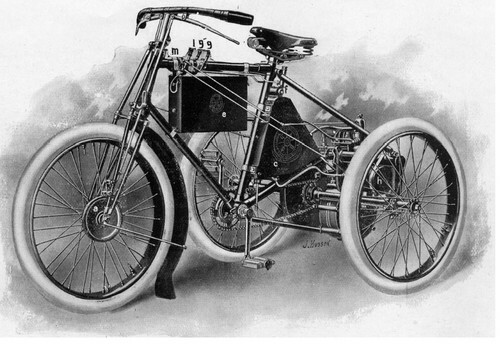 In 1900 the improved model was released using a de Dion four stroke single cylinder 230 cc engine. 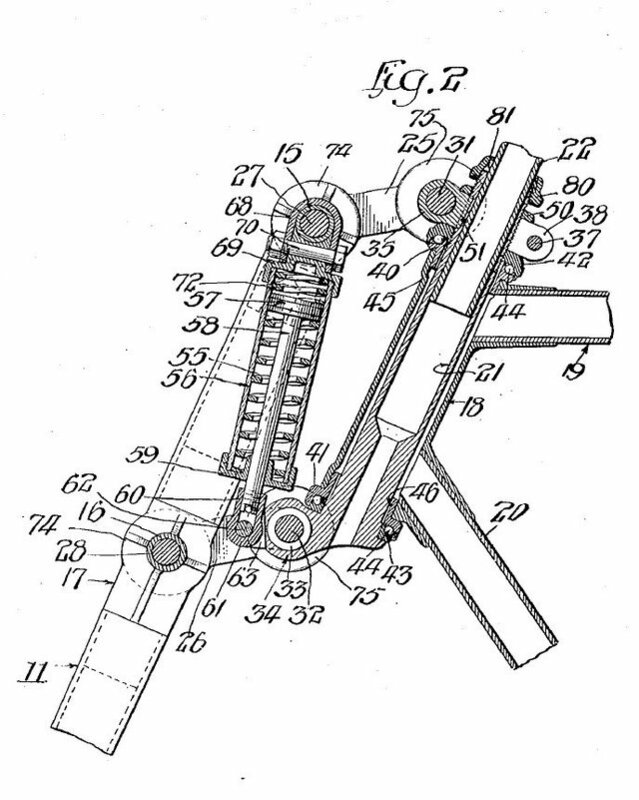 The 1.5 hp engine drove the rear wheel with a belt, and pedal power was retained as a back up and to get the motorcycle up to speed before the motor was engaged, since there was no clutch. 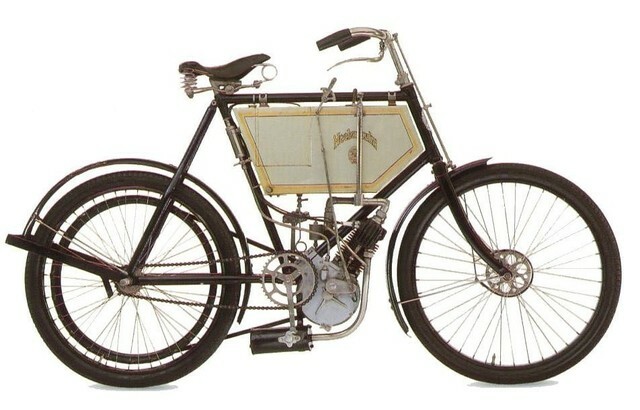 The engines were small, but the frame was very light, so the Werner had a great power to weight ratio. 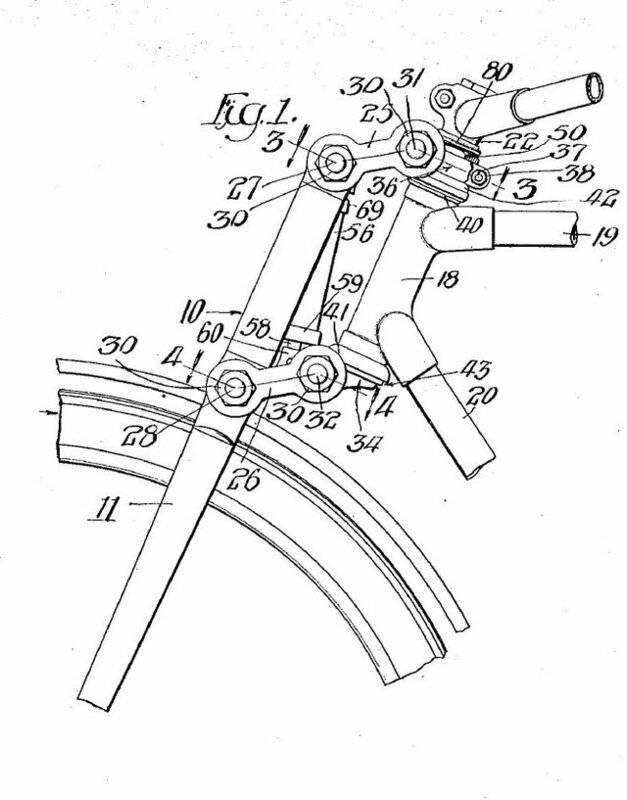 Drawing is from Motorcycles of the 20th Century.